Can small-scale farming in the modern age really generate enough income for the average family to make an honest living? For Jean-Martin Fortier and his wife, Maude-Hélène Desroches, it does. The Canadian couple grows beets, broccoli, salad greens, carrots, and various other types of produce on their modest 1.5 acres of land, from which they generate an average of at least $140,000 per year in sales – not too shabby! They tell all in their new book The Market Gardener: A Successful Grower’s Handbook for Small-Scale Organic Farming, sharing many of the secrets they’ve uncovered about the local nature of food production. There’s no need for large agricultural organizations to “feed the world,” as goes the mantra, when everyday people are feeding themselves and their communities, they explain. And those who do it right have the potential to reap a financial windfall as well. Proof you can get into agricultural business if you put your mind to it! While the general perception is that farming, and especially the “backyard” variety, is more of a hobby for most people than it is a source of income, Fortier and his wife believe otherwise. Their own successful farm serves as living proof that it’s more than possible for people to get into the agricultural business and do well if they possess the drive and wherewithal to make it happen. Born and raised in Quebec, Fortier started farming with his wife when he was still an intern at WWOOFers, a worldwide organic farming movement that promotes cultural and educational experiences to help people form communities around locally-grown food. They started out by renting some land to grow food, and gradually worked their way up to owning their own land and launching a full-scale business out of it. Today, they grow an extensive mix of produce that requires them to work the land for nine months out of the year. From their bounty, the feed 200 families a week that subscribe to their community-supported agriculture program, also known as a CSA. Members of a CSA typically receive a fresh box of produce weekly or bi-weekly as part of their subscription. But what about organic growing methods? Foregoing the use of chemical pesticides and herbicides oftentimes comes with added costs and labor, not to mention the possibility of lower yields. Does growing organic food specifically still bode well in the profit department? According to Fortier and his wife, absolutely. 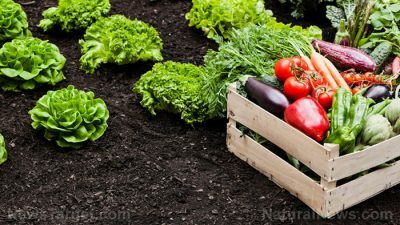 When they first started out, the couple adopted unique methods of growing food that Fortier describes as being “biologically intensive.” Many of these natural methods of permaculture they still use today, including conservation tillage, permanent growing beds, and crop rotation, all of which have proven to be a huge success. Fortier and his wife also do much of the work on their farm by hand rather than use expensive equipment – and yet still generate impressive sales numbers. They apply organic fertilizer, save seeds, manage weeds, insects, pests, and disease, and even harvest their crops using simple, traditional methods of old that still allow them to remain competitive in the agricultural marketplace.